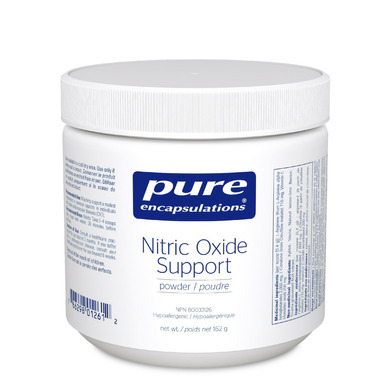 Pure Encapsulations' Nitric Oxide Support is an arginine-based formulation designed to support a modest improvement in exercise capacity in individuals with stable CVD. Nitric Oxide Support is an arginine-based formulation designed to support a modest improvement in exercise capacity in individuals with stable CVD. Arginine, a precursor of nitric oxide, supports healthy circulation by promoting endothelial function, blood vessel tone and healthy platelet function, as indicated in several randomized cross-over trials. Arginine may support the delivery of oxygen to working muscle, protect muscles from oxidation and moderate lactate dehydrogenase activity during intense exercise. Arginine may also support post-exercise lean mass and muscle repair to further help improve exercise capacity in individuals with stable CVD. The delivery forms of arginine offer the Krebs cycle intermediates alpha ketoglutarate and malate for enhanced energy production. l-Citrulline is a non-essential amino acid that is converted to arginine, enhancing nitric oxide production. Vitamin C is also included in this formula to provide antioxidant protection. Easy to add to morning blender fruit shake. Adding this to my morning regime has noticeably helped my post-MINOCA heart health!